"Lion" glassware was produced by various glasshouses from 1876 to about 1900. The lion may appear in an array of poses. The first category includes different versions of the lion's head: a single head, or a single head and paws. The second classification involves the lion face only: a solitary lion face, the twin lion faces, and the three lions faces (sometimes including paws). The entire animal is dpicted in the third group: the crouching lion, standing lion (occasionally in high grass or under a palm tree), sitting lion, and praying or rampant lion scrtching a tree trunk. Finally, the lioness may be portrayed crouching or wounded, flanked by her mate and two cubs. Demanding designs employed called for intricate molds with the final results displaying detailed areas in relief. Pieces may be clear, many are further enhanced by having certain sections frosted, and some are engraved. The "Tiny Lion," by an unknown maker, was manufactured in the early 1880's in both clear and a combination of clear and frosted areas. Produced in a variety of tableware shapes, it's possible that this design was patterned after a similar rendition by Gillinder and Sons. As the name suggests, the full lion figures are quite small and almost rigid and statue-like. The tiniest lions reclining on the tops of handles have outstretched front paws and eyes gazing straight ahead. The larger frosted lions employed as finials are positioned upon oval pads, attache dto the frosted round bases whcih may have a scalloped edge. These lions also stare ahead intently, and the molds were designed without even the smallest openingss between the legs. "Atlanta," or "Frosted" and "Clear Lion's Head," is usually characterized by bull's-eyes and scallops which separate lion's heads located on each of the four corners. Some pieces also have a scalloped top edge, while remianing ones are somooth-rimmed. Exceptions the square sides are the drinking vessels. 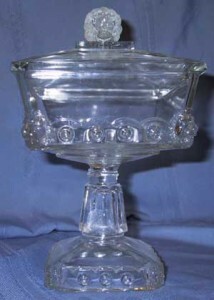 The pattern was manufactured by the Fostoria Glass Company, Moundsville, West Virginia in 1895. Some pieces also have etching or engraving. This pattern is certainly considered very collectible, but examples do not command the high prices that Gillinder's "Lion" glass brings. Gillinder's "Frosted Lion" was first introduced at the Centennial exposition in 1876. A true test of a genuine piece of "Frosted Lion" would reveal excellent details, especially the fur on the animal. Also, the frontal view of a genuine lion piece will present a pleasant gaze, where a reproduction is almost grotesque in appearance. A true "Frosted Lion" glass has lead in the batch when it was produced. Under ultra-violet light the example will have a blue florescence; otherwise it should be considered suspect. The "Crouched Lion" cologne bottle, powder jar, syrup jug, and oval covered compote with "Sitting Lion" finial are considered rare, as are the "Lion Head" kerosene lamp and the frosted "Lion Head and Paws" round paperweight.